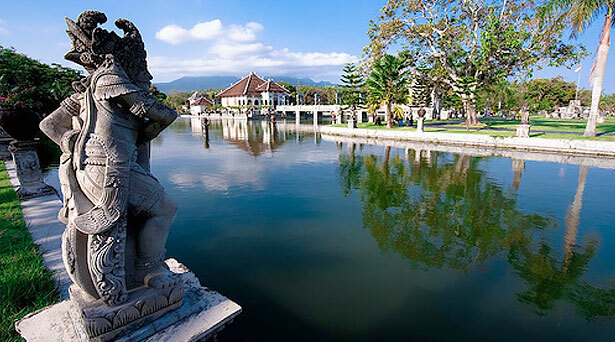 Tirta Empul is the name of a temple located in the village Tampak Siring and many tourists visited this temple, both foreign and domestic tourists. This temple has spring water that being used as holy water for various religious ceremony for Hindu people. Tirta Empul built in 962 AD is a place for self-cleaning (melukat, Balinese language). Not cleaning physically, but spiritually / spiritual. This place is situated about 40 km, northeast from the city of Denpasar. Precisely, in the Village Manukaya, Tampaksiring District, Gianyar Regency. 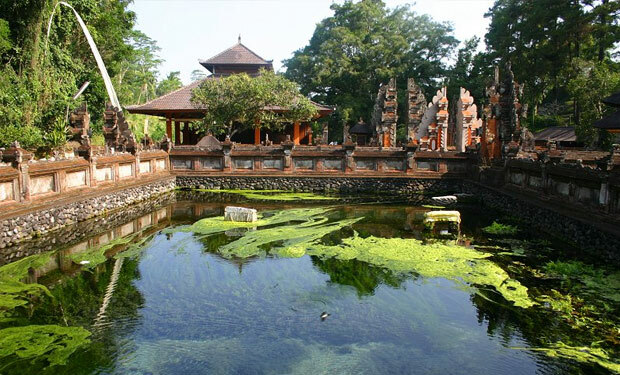 To achieve Tirta Empul, visitors only need the longest time 1 hour drive from Denpasar. The road to Tirta Empul entirely paved and smooth. Like the other temples in Bali, Pura Tirta Empul is composed of three parts, Jaba Pura (Home), Jaba Central (Central page), and Offal (page in). In the Middle Jaba there are two rectangular pool that has 30 pieces showers, lined up from east to west, facing south. Each shower was traditionally has its own name such Pengelukatan showers, Pebersihan, Sudamala, and Shower Cetik (Poison). Most visitors come to this temple for the holy water that gushes from a dozen showers. Balinese people flocked there for self cleaning or melukat including others from outside Bali and abroad. By doing the self cleaning from the spring water, all visitor want to experience sensational feeling and get the blessings at the same time. There are certain rules that visitors have to obey and comply if they want to do self cleaning or melukat. The rules and instructions are all written clearly at the entrance of the temple. Local staff will also be pleased to provide guidance if needed. Holy water or well known in Balinese as Tirta, have 3 different purposes that very important for people’s live. First is Tirta Gering for cleaning bad or evil spirits, second is Tirta Merta for prosperity and third is Tirta Sudhamala for purifying body and soul. Tirta Empul water comes from ground water resources (klebutan–language Bali) which flows unfailing. According to a credible information, the fountain came from meeting a number of the “river” flowing deep underground. Source of water is spraying out coalesce and the surface and accommodated in a big pond. From this large pool of water that flowed into the fountains. It is a gift of God that is unparalleled. Can you bath in this water if you are pregnant?